Last week, a bunch of new patents for Microsoft’s foldable or dual-screen mobile devices were published on USPTO. 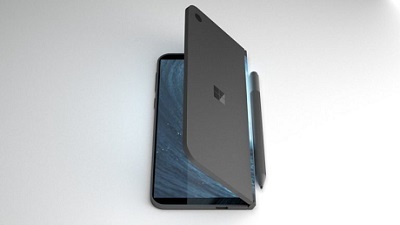 The patents have revealed the ideas that Microsoft inventors have imagined for the company’s dual-screen device but as it is the case with all patent applications, there is no guarantee that this patented device will ever make it into a consumer product. There are two new patents that went unnoticed and both were published by USPTO on November 15. The first patent details a dual-screen device with the ability to adjust the volume and the second patent appears to detail another dual-screen device that can display data on first or second display simultaneously. The patent titled “VOLUME ADJUSTMENT ON HINGED MULTI-SCREEN DEVICE” was published on November 15 and it appears to detail a device featuring two displays, a front-facing camera on the first display and another front facing camera on second display. It also features a speaker. In the background section of the patent application, Microsoft explains the audio volume problems that many customers may have experience when using mobile computing devices. “Users interact with multi-screen mobile devices throughout a variety of positions, including holding the device vertically, holding the device with a primary screen facing toward the user, holding the screen with a second screen facing toward the user, and other positions and orientations. When viewing content on the screens in these varying positions, users may encounter challenges adjusting the audio volumes of different applications executed on each of the screens, or different audio-enabled graphical user elements displayed on each of the screens,” Microsoft writes. Want to know more visit OUR FORUM.